Duplicate Check for Salesforce is able to integrate with the Entry page of Record Validation. Besides validating your records, see if the new record that you are creating already exists in Salesforce. Haven't installed Duplicate Check yet? Download now from the AppExchange. 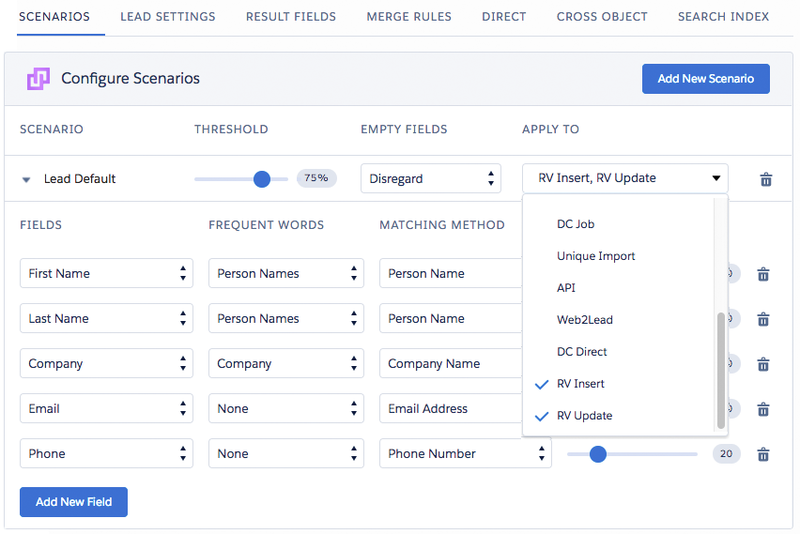 1.1 In Salesforce, navigate to the DC Setup page. 1.2 At 'Object Setup', click the Object you are using with Record Validation. 1.3 At the scenario's tab, pick a scenario that you want to use to detect duplicate records in Record Validation. 1.4 At the 'Apply to' section, apply the scenario to 'Record Validation Insert' and 'Record Validation Update'. Applying the scenario to Record Validation Insert will trigger Duplicate Check's prevention feature when inserting a record. Record Validation Update will trigger the prevention feature when updating a record. Want to find out more about Duplicate Check and scenarios? Please visit our Duplicate Check knowledge base.